No matter how beautiful a girl’s face is that is not enough always, the hands are equally important too. So enough attention has to be paid to the hands as well. Well moisturized, soft and smooth hands always create a good impression. As far as hands are concerned, most of us have one common issue and that is the dark knuckles. No matter how beautifully shaped your nails are, a dark knuckle attracts the attention totally. A dark knuckle means extra care is required to that area because the damage has been done already so now it has to be mended. The knuckles are the area that is exposed to vigorous friction, thanks to the extreme use that we put it through. Be it while writing or just sitting on a chair the knuckles as well as elbows are always used the most. Apart from that the exposure of the skin to sun aggravates the situation further. The main reason behind dark knuckles is the melanin that forms in the body which causes hyper pigmentation. The reason for melanin formation is over exposure to sun’s ultraviolet rays. The dead cells also accumulate in the body and causes darkening of knuckles. 1. A good scrub: A good exfoliation is very important to get rid of dark knuckles as the main reason behind the them are accumulation of dead skin as previously discussed, therefore a good scrub can help you to remove all the unnecessary pile up of dead skin. Mix sugar and lemon juice and apply this on your fingers and scrub it in circular motion for around five to ten minutes. This has to be carried out regularly for a few days to achieve the desired result. You can also try cutting a lemon into half and rubbing it over the skin for some time prior to bath. This also ensures whitening the skin. 2. 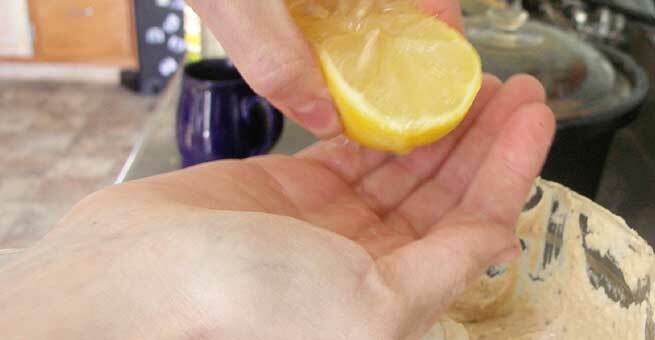 Bleach the skin naturally: The dark knuckles can be bleached naturally by applying lemon juice and honey mixture for about ten minutes daily. The lemon and honey combination works well as a bleach and helps in lightening the skin. Mix these ingredients in a bowl thoroughly and apply it on the affected area and leave until it dries and wash it away. This treatment has to be done for around one month and you will be able to see a visible difference. This pack helps in getting rid of the tan and making the skin brighter. 4. Almond oil: Almond oil is really good for skin. The oil can be massaged on the knuckles and left for ten minutes. If done regularly this will help in reducing the pigmentation and make the knuckles lighter. 5. Vitamin E and milk cream: Get Vitamin E capsules, it is easily available in all drugstores. Take one Vitamin E capsule and into it add 1 teaspoon of milk cream. Apply this mixture on the knuckles as well as other rough areas of the skin. Massage well for about ten minutes. This is a very good remedy for dark knuckles and it moisturizes the skin. 6. Pamper your hands: Take some warm water, put some baking soda, glycerin as well as rose water. Now soak your hands in this water for minimum 5 minutes. This will help in decreasing the dark knuckles. 7. Pumice stone: Pumice stone is very much a part of a manicure and it is mainly to scrub away the dead skin from the knuckles. You can use pumice stone daily while taking bath to rub your knuckles, this will help in lightening the area.